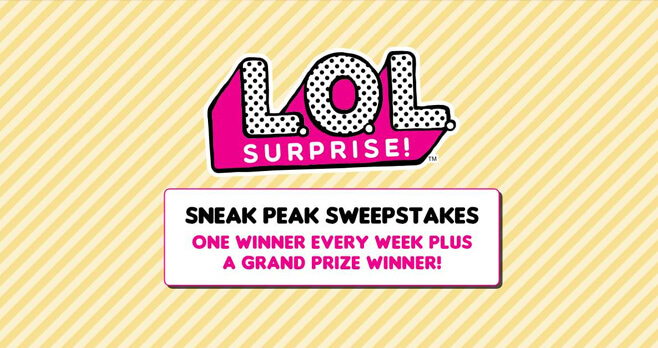 Visit lolsurprisesneakpeek.com now through July 13 and enter the LOL Surprise Sneak Peek Sweepstakes for your chance to win all-new L.O.L. Surprise toys. A new winner every week plus a grand prize winner. Ends: July 13, 2018 at 11:59pm PT. Prize: Grand Prize consists of a full set of four L.O.L. Surprise! toys. Eligibility: The LOL Surprise Sneak Peek Sweepstakes is offered only to legal residents of the 50 United States, the District of Columbia, the United Kingdom and Canada (excluding Quebec) who are at least 13 years old at the time of entry. I really want to win a lol big sister.I hope you have a lovely day by Aymee. Please can you send me lol sneak peek at India. I’ve never got to get a lol sneak peek. I never saw the lol surprise. Its very good and I like it.Thankyou. I like it so, I am very happy. I am ,so happy that I am getting a lol surprise sneak peek.